Take a look at our beautifully refurbished cottages in the picturesque Scottish Borders where you will be assured of the warmest welcome. After more than 20 years of enjoying all of the delights the city has to offer, we ran away to the countryside. And do you know what? It’s pretty good out here in the sticks. So much so, we thought you might like it too. If the wholesale upping sticks and moving here is a little too much for you, why not come for a few days and flop down in one of our beautiful cottages in the Scottish Borders? It’s a truly restful place to be. Pour yourself a drink and take it into the garden or curl up in front of the wood burner. That’s better. Leitholm Cottage and Newton Cottage are secluded in a pretty small village which is within easy reach of a wealth of facilities, activities and attractions so you can be as relaxed or busy as you choose. There’s a friendly village pub with a great selection of local craft beers, prosecco chilling in the fridge and home cooked meals. It also does newspapers, free range eggs, home baking and freshly made takeaway fish & chips - and is dog friendly with a lovely beer garden. 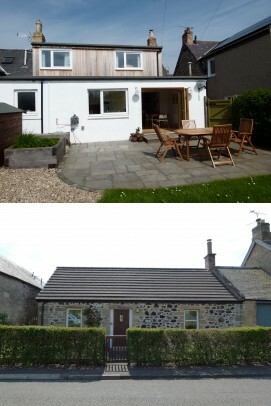 The cottages have been a big project for us and we’ve done a lot of the renovation work ourselves. Please enjoy and look after them as you would your own. We want you to have a wonderful, relaxing stay and welcome any ideas or suggestions on how we can improve. We live in the village. We will be there to meet you and on hand whenever you would like local knowledge or suggestions. We will absolutely respect your privacy, but if you need help with anything, don’t hesitate to ask. We can provide extra wood and kindling for the stove at a small charge. A maximum of two well-behaved dogs are welcome at Leitholm Cottage. Guests must bring dog beds, bowls etc and dogs are not allowed on carpeted areas or on the sofas or beds. We ask that guests clean up after their dog both in the Cottage and in the garden. Travel cot and high-chair and stove guard (for Leitholm Cottage) available on request, when booking. We can also provide you with locked garage storage for your bikes, fishing rods, outdoor gear etc. Safety Features: Smoke and heat and CO detectors, fire blanket, first aid kit. Leitholm Cottage is the perfect place for families or groups of friends and four legged friends too as we welcome up to two well behaved dogs. It’s got a lovely, big garden with a choice of seating areas and a BBQ for when the sun shines. There is also a play park in the village which is great for kids. There is mains gas fired central heating with a combi boiler supplying hot water on demand. Wifi is provided free of charge. You’ll also receive a welcome pack with a tasty selection of goodies including some free range eggs from my chickens, plus some staples in the kitchen. The living area is a generous space, with carefully chosen fittings, art on the walls and a wood-burner to keep your evenings cosy. There is also a Sonos Play 1 bluetooth sound system, wifi, digital TV and DVD player. There’s a good selection of DVDs and also jigsaws and games if you fancy a digital detox. The dining area is open plan to the kitchen, with a large table to easily accommodate six and flooded with natural light from the bi-fold doors opening out onto the patio and garden. A well-stocked kitchen with a selection of cook books to inspire you. There are cream Shaker-style units and lots of lovely crockery and glassware. And if there’s any particular piece of kitchen kit you need that’s not there, I’ll be only too happy to help out. Champagne glasses? Of course there are champagne glasses! A good-sized family bathroom with shower over the bath and hot water on demand. And lots of fluffy white towels plus organic toiletries from the Highland Soap Co.
On the ground floor, there is a generous bedroom with sumptuous duvets and pillows and Egyptian cotton bed linen and beautiful throws and blankets. You can sleep deeply in this large, uncluttered bedroom with white walls, good lighting and colourful art on the walls. And of course, a huge pocket sprung mattress, comfortable duvets and pillows and cosy blankets and Harris tweed cushions. The super-king bed can also be divided into two single beds, to give more flexibility for groups of friends or families. A beautiful bedroom with a comfortable bed and a small sofa in the sitting area with an interesting selection of books to while away an hour or two. Again, white Egyptian cotton, colourful cushions and soft blankets. The porch has hooks and a boot rack, the ideal place to store your stuff after a long walk. The large, enclosed garden is a peaceful space with views over surrounding countryside and towards the Cheviots, mature trees and well-established shrubs. There is a large patio area immediately outside the bi-fold doors from the dining area, with seating for up to eight. Follow the winding path down the length of the garden and you’ll find another patio area with rattan seating. A perfect place to enjoy drinks and the beautiful views over the surrounding countryside. On a clear night, the sky flaunts a sparkling shawl of stars so wrap yourself in a rug and pour yourself a glass of something warming. Also, please help yourself to apples and soft fruits when in season. There’s also every chance I’ll have a glut of vegetables so you might find yourself the recipient of a mixed box! Newton Cottage is a beautifully converted old cottage which creates a snug bolthole for one or two when you want to escape and enjoy some rural luxury. Curl up in front of the wood burner, pour a glass of wine and relax. You step into a homely, open-plan sitting room with a plump sofa to sink into after a hard day exploring the Borders and a cosy dining area to enjoy the fruits of your labours in the kitchen – or delicious fish and chips from the Roaming Chippy! A wood burning stove and bright rug spread across the floor create a cosy feel. I live in the house next to the cottage and I’m on hand when needed or if you’d like any tips for adventures in the local area. Help yourself to home grown veg from my vegetable garden: peas, beans, beetroot, curly kale, fresh herbs, rhubarb, carrots along with salad leaves of every kind. The living room has a large, comfortable three seater sofa and a cosy armchair, there is more than enough seating to sprawl and relax. There is also a dining area with table and chairs to enjoy the fruits of your labours in the kitchen. It’s fully equipped with internet HD TV and DVD player (with a wide selection of DVDs to choose from) and Sonos Play 1 blue tooth sound system. There is a collection of books and jigsaws to hopefully suit all tastes if you fancy a digital detox! A wood burning stove with a basket of logs will keep you toasty warm. We can provide you with an additional supply of logs and kindling at a small cost. The dining kitchen has been very well kitted out. You’ll find all the tools for cooking delicious meals, along with a selection of cook books to inspire you. And if there’s any particular piece of fancy kitchen kit you need, I’ll be only too happy to help out. It’s also got a table and chairs to give you the option to eat there or in the sitting area. This room has a super-king bed with a pocket sprung mattress, sumptuous duvets and pillows and Egyptian cotton bed linen and beautiful throws and blankets, you’ll be sure of a blissful sleep. There is a large wardrobe with hanging space and drawers, a chair and bedside tables for your book and cup of tea. A beautiful, tranquil bathroom with shower and hot water on demand. Also, some fluffy white towels and lovely Highland Soap Co organic toiletries to enjoy during your stay. It has hooks and a boot rack, the ideal place to store your stuff after a long walk. Your own peaceful, private “sit ooterie” which catches the sun throughout the day and has a table and chairs and BBQ for summer days. On a clear night, it’s also a magical space for a bit of star gazing, dram in hand. We hope you enjoy reading about what is going on at Katie's Border Cottages. Please visit our blog to be the first to find out about any news and special offers. It's a gorgeous spring day here at Katie's Border Cottages and I've been sprucing up the cottage gardens ready for guests. Do you get Badedas for birds? I wonder if you get Badedas for birds? With best wishes to all of our guests for a happy and healthy 2017. It's very difficult waiting for the sloe gin to mature. Got a glut of tomatoes? Get your chutney pan out. It's a Friday afternoon in August and I'm reflecting on the Summer so far at Katie's Border Cottages. I’m delighted to launch the new website for Katie’s Border Cottages. Please have a look around and let me know what you think. We are very lucky to live in such a beautiful part of the world – it’s a cliche but there really is something for everyone. Whether you are up for a big adventure or just want to chill and do very little then read on and plan your perfect itinerary. For the more active amongst you there are amazing walks, mountain biking, fishing and golf up for grabs. You can visit one of the many historic houses in the area or just take in the beautiful views and relax in your luxurious cottage. If you want to travel further afield Edinburgh and Newcastle are an hour's drive or a train journey away. From the doorstep you can walk for miles in the beautiful countryside. There’s a wealth of wildlife and striking scenery with fresh air and beautiful, pastoral views all around. Walkers are well placed for tramping through the Borders countryside and along the coast while birdwatchers can spot to their hearts’ content. We get long days in the summer with a lot of sunshine and surprisingly low rainfall for Scotland. There are picnic sets in both cottages and beach towels if you fancy a day at the beach. In the winter, cosy nights by the wood burner, a quiet pint in the pub and sparkling clear days. On a clear night, beautiful dark skies with very little light pollution so you can star gaze. Sometimes we get snow and then it transforms into a winter wonderland. 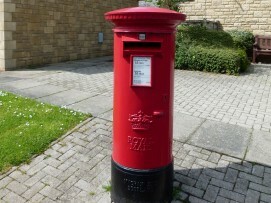 Have a look through what’s on offer in the surrounding area – you will be spoiled for choice. We have tried to provide as much information as possible here and in the cottages but feel free to ask us if you have something particular in mind. Leitholm is a pretty, small village with a friendly pub serving local craft beers and good food, plus freshly made takeaway fish & chips. If you’re looking for a peaceful and relaxing break, this is the place to come to! 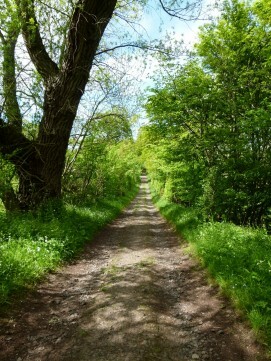 With beautiful Borders countryside surrounding the cottages, gorgeous walks from the front door and plenty of wildlife to spot you can enjoy the peace and tranquillity of rural living. But also nip along to the pub when you fancy a pint and someone else doing the cooking for you! The tap-tap of woodpeckers and singsong of birds are the soundtrack to your stay at Leitholm. There is no shop in the village however it’s only a short drive to Coldstream which has a well-stocked Co-op, award winning butcher and bakers or 15 minutes to Kelso which has Sainsbury’s, Lidl and a great range of independent shops with bakers, a fishmonger, butchers and pubs and restaurants. The Roaming Chippy fish and chip van comes to the village between 5.30pm and 6pm every Wednesday night and serves delicious fish and chips, among other things. The pub also does fish and chips to take away (Thursdays and Fridays) and sells newspapers and free range eggs. Leitholm is a perfect place for chilling out and doing absolutely nothing. But if you do fancy getting out and about, there is lots to see and do. We’re surprisingly close to Edinburgh and also Newcastle. Berwick upon Tweed is 25 minutes by car and is on the East Coast mainline. Within the Borders, there are lovely historic towns to visit (particularly Kelso and Melrose), stunning coastline (try walking along the cliffs at St Abbs or along the beach at Coldingham) and a network of gorgeous paths for walking through the beautiful countryside and along the Tweed and Teviot. For ideas for things to do during your stay, see the section on Top Ten Things to do in the Borders and also the section in your cottage handbook. And please just ask – we’re always happy to provide suggestions as we know and love this area. Idyllic countryside, rolling hills, spectacular coastline and beautiful beaches all make for varied and interesting walking. The area is crossed by a multitude of paths and three excellent long distance routes (St. Cuthbert’s Way, Borders Abbey Way, Southern Upland Way). Every year the Scottish Borders holds a walking festival. Gentle hills, woodland, river tracks and low urbanisation create the ideal place for both mountain biking and more leisurely pedalling around. There is good signage and many cycle routes (e.g. the 4 Abbeys, the Tweed Cycleway, the Borderloop) and 7Stanes at Glentress/Tweed Valley for adventurous mountain biking. And don’t miss the Tweedlove Bike Festival which has two weeks of cycling for all levels, including some serious international talent. With its beautiful rolling farmland producing meat and vegetables of the highest quality and a spectacular coastline providing delicious sea food, the Borders is a foodie’s paradise. It also has several micro-breweries producing really tasty craft beers, its own whisky distillery and orchards giving up delicious apple juice and cider. 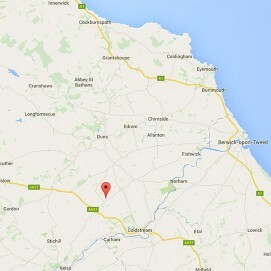 See the Borders Food Network and Visit Northumberland websites for suggested foodie trails. You will be spoiled for choice if you fancy wandering round some of the country’s most spectacular stately homes: Abbotsford, Bowhill, Floors Castle, Manderston, Mellerstain, Paxton, Thirlestane, Traquair. Check out the websites for each house as many host great events, including fun things for kids to do. Bowhill has a great adventure playground. Independent shops are king in the Borders and the area is fortunate to have a vibrant history of textiles and cashmere. Kelso, Melrose and Peebles are particularly enjoyable places to spend a day wandering around the range of independent shops and having a spot of lunch. There are numerous lovely shops selling clothes, fishing tackle, homeware, locally made art, pottery and jewellery, gifts and Borders artisan produce. If you like textiles and cashmere, it’s also worth taking a trip to Hawick and Selkirk for the Lochcarron Experience and Johnston’s of Elgin mill, shop, visitor centre and cafe. We are fortunate to have so many talented artists and craftspeople living, working and exhibiting in the Borders. Check out the Crossing Borders website for profiles plus current exhibitions. For original artwork, there are some fabulous galleries: the Breeze Gallery and Moy Mackay in Peebles, the Flat Cat Gallery in Lauder, Tony Huggins-Haig Gallery in Kelso, the Coldstream Gallery, Allanbank Arts Centre in Duns, Smailholm Pottery, Tom Davidson in Earlston, Gallery Number Four at St Abbs, White Fox Gallery at the Hirsel, Coldstream. If you fancy getting creative yourself while you’re here, take a look at the courses on offer at Allanbank Arts and the Stonewall Gallery. Various estates across the Borders provide shooting packages. A good place to start for information is to have a chat with the owners of Castle Gunmakers in the lovely village of Norham (just across the border into Northumberland). There is also very good quality clay shooting and instruction at Bisley of Braidwood. The Tweed offers world class fly fishing and is perhaps best known as a salmon river, but it also contains good stocks of wild brown trout and grayling. It is around 97 miles in length and is fed by several tributaries which include the Lyne Water, Gala Water, River Ettrick, River Leader, Rivers Teviot, Till and Whiteadder. Coldingham Loch also offers loch fishing for brown, blue and rainbow trout from bank or boat. See the FishPal website for river conditions, beats and also local guides. The Borders has a championship golf course at the Roxburghe estate and also some charming, smaller courses including “the Augusta of the North” at the Hirsel, Coldstream. Common Ridings: Why not try something you can’t do anywhere else? The Border Common Ridings are celebrations of the riding of the boundaries that have taken place for centuries at towns throughout the Borders. Eleven towns participate, with riders on horses massing for the traditional ride out. The festivals surrounding these ride outs are steeped in tradition and celebrate Borders history, music and song, parades and concerts culminating in the whole town celebrating the ‘Riding’. Authentic and truly local. Borders Book Festival: Held every June in the beautiful Harmony Gardens in Melrose. An intimate and friendly festival of not just books but also comedy, music and great food with lots for kids too. Melrose Sevens: phenomenal rugby tournament in this beautiful Borders setting. Big lads playing here since 1883. Once local now global. Beyond Borders Festival: annual International Festival of Literature & Thought at Traquair house. This event brings together internationally renowned broadcasters, writers, thinkers, artists, diplomats and politicians to meet, talk and exchange ideas with the public about some of the most interesting and pressing issues of our time. This stimulating weekend of debate also includes bike rides, literary walks, art exhibitions and performances. Take the A1 signposted for The North (Morpeth). On the A1, take the A697 exit for Coldstream. Continue on to A697. You will enter into the town of Cornhill on Tweed. At the roundabout, take the 1st exit onto Main St for the A698. Continue to follow the A698 and turn right onto Guards Rd. Then take a right onto Duns Rd. At the junction, take the left onto the B6461. Continue along the B6461 until you enter the village of Leitholm. Leitholm Cottage is on the left shortly after you enter the village just past and opposite the village hall. It has roses growing on the wall and a slate sign saying “The Cottage”. Newton Cottage is on the left approximately half way down the village opposite the children’s play park. It has a blue door and a slate sign "Newton Cottage". From Glasgow, take the M8/A8/M8 towards Edinburgh. At the end of the motorway, take the 3rd exit right at Hermiston Gate roundabout onto A720 CITY BYPASS SOUTH. After approx 9 miles take the third exit straight through Sherrifhall Roundabout CONTINUING ON THE A720. After approx 1 miletake the first exit left, at the junction for the A68 (JEDBURGH) and turn right under the bypass taking the A68 for JEDBURGH. After approx 15.5 miles take the 1st exit left at the Carfraemill roundabout onto the A697 towards GREENLAW and COLDSTREAM. After approx 20 miles and after passing through GREENLAW, turn left at the JOHN DEERE TRACTOR SHOP onto the B6461 towards BERWICK, LEITHOLM and SWINTON. 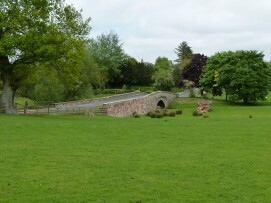 After approx 1 mile you will go round a twisty bend and over a narrow hump back bridge into LEITHOLM. 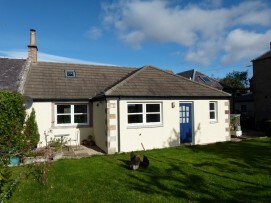 Leitholm Cottage is the last in a row of four terraced cottages, towards the end of the village on the right after the children’s play area and bus stop and before you reach the village hall. It has roses growing on the wall and a sign outside saying “The Cottage”. Newton Cottage is on the right approximately half way along the village opposite the children’s play park. It has a blue door and a slate sign "Newton Cottage". 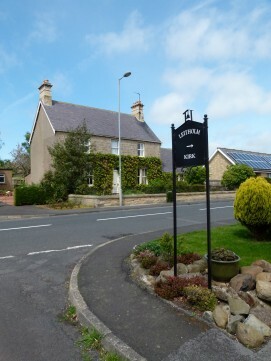 Leitholm Cottage: On-street parking is available outside the village hall nearby. You can bring the car to the door of the Cottage for drop off, pick up and unloading. Please don’t park directly in front of the Cottage. Newton Cottage: On-street parking is available directly outside Newton Cottage. The key will be left in the key safe which is positioned at the front door. Please use the key safe code which I will send you in advance of your stay. Please leave the key in the key safe when you leave. Please call me on 07789 878 709 or 01890 840 457 in advance of your stay to provide an indication of your proposed arrival time. If I’m around, I would be delighted to meet you at the property to show you round the cottage and explain any essential details. Having benefitted hugely from massage and other complementary therapies while in a busy and stressful job, I finally gave in to a mid-life crisis and decided to change career and study massage. I hold a Diploma in Swedish Massage from the Scottish Massage School. I see clients for massage at my home, in my holiday cottages and also in the comfort of their own home. Swedish massage is a strong but relaxing massage, using nourishing natural massage oils to help bring about a state of tranquillity and deep relaxation. It is also great for easing muscular strain. The pressure and techniques used in Swedish massage are tailored to you individually. Communication is encouraged so that your massage is customised to your specific needs. First, you choose the length of treatment you want when you book. We can have a chat about what you want to achieve from massage and I can make some suggestions on what treatment length and type might be best. I’ll conduct a thorough consultation with you to ascertain whether you have any injuries or conditions that may present a contra-indication to massage or which I should be aware of so I can tailor your massage accordingly. During your massage, I keep you covered with towels/blankets and only uncover the part of your body I’m working on so you should feel comfortable at all times and not exposed. I uses massage oil/wax and perform various massage strokes to warm up your muscle tissue, release tension and gradually break up muscle "knots" or adhered tissues. Afterwards, you'll probably feel quite relaxed and maybe even sleepy, so give yourself plenty of time to unwind. Once your treatment is complete, I’ll check with you on how you’re feeling and also give you some after-care advice. There will be an additional charge to cover my time and travel for mobile therapies conducted outside my home or holiday cottages. The amount will depend on distance and time taken and I’m happy to discuss this in advance. If you would like any further information or would like to book one of our cottages then please get in touch. You can see our 2019 prices below but please contact us for short break pricing and any last-minute offers. You can phone us on 01890 840 457 (landline) or 07789 878 709 (mobile). Alternatively you can email us at katie@katiesbordercottages.com or fill in the form below and we will get back to you as soon as we can.